Stonehaven has some of Scotland’s most wonderful, historical and romantic buildings. However, Dunnottar Castle stands out above all the rest. 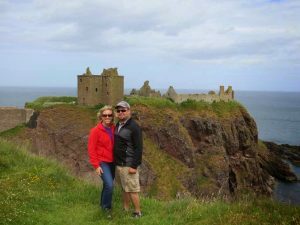 Sitting on the edge of the North-Sea, 2 miles outside of the town, you can find the mighty Dunnottar Castle. 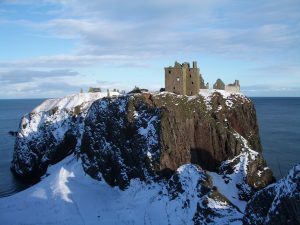 The castle is a medieval fortress that looks out from the Scottish cliff tops. Upon your visit, you wouldn’t want to fall down this 50 metre drop into the North sea. The castle was formerly the home of the Earls Marischal. The Marischal were once upon a time one of the most powerful families in the country. And yet, even more famous name have graced the walls of this landmark. The many famous Scots that have visited the castle, include Mary Queen of Scots and Kind Charles II. And as movie fans will be particularly interested to know, William Wallace, played by Mel Gibson in Braveheart. Furthermore, the castle is a source of pride for many modern Scots, as the protected the Scottish Crown Jewels from Cromwell’s forces. This is known as the “Honours of Scotland”. Today the castle is a ruin, with only part of the original historical building still intact. However, the walls still extent 3.5 acres. There is a upward road to the gates of the castle before you approach the many buildings that make up the castle. Most notably, these include the tower house, which was originally constructed in the 1300s. The 16th century palace building is also impressive and unforgettable. Visitors are welcome to visit the castle throughout the year. While during in poor weather conditions, the castle may be closed. If you visit, in order to do this historic monument justice, you should spend at least an afternoon to truly experience everything it has to offer. There is an entrance fee of £7 for adults and £3 for children. However, many families opt for the £17 family deal, which includes 2 adults and 2 children. Whether you’re interested in Scottish Medieval history, or just want a fun day out with the kids, visit Dunnottar Castle today for an experience of a lifetime.